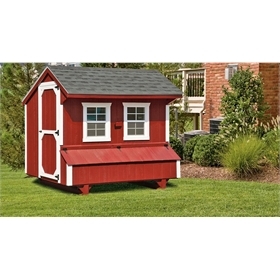 Come see why we've sold so many of this coop model! 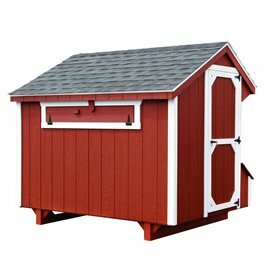 Its sturdy, Amish design is built to last for years, and the highly customizable design allows you the features you want, including electrical hook-up with an outlet and a light; wheels to turn it into a "tractor"; an automatic door that operates on battery, electric, or solar, and operates on a timer or by light sensor; and a great variety of color and material choices. 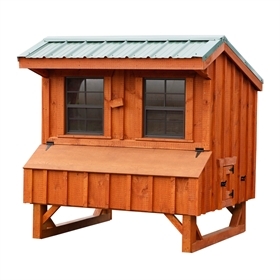 We love this coop and we love supporting American-made goods—don't you? See below to learn all about this coop. PS: You might see "lookalikes" available for sale on other websites or at your local feed store. 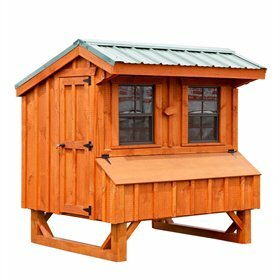 Ours is better, and here's why: the standard version of this coop -like those other guys sell- is missing several key features. We have ours custom-made to the MPC standard so they actually work for our clients, with extra ventilation and predator protection features. Please allow up to two months for delivery. 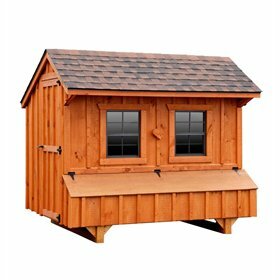 Each coop is made to order. Epoxy Flooring is one of our "Cleaner Coop" Options. 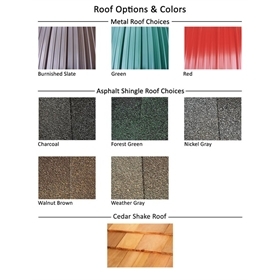 It is durable, easy to clean and 100% moisture resistant. 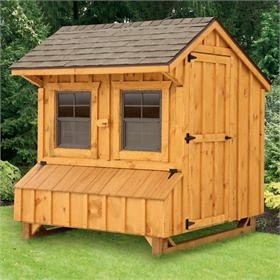 This classic chicken coop is handcrafted by the Amish in Lancaster County, PA, using high quality materials. Each coop is made to order! 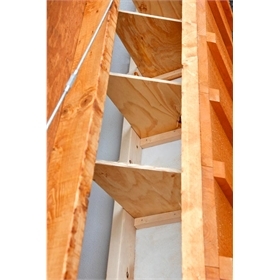 The pressure-treated base and flooring will keep termites, carpenter ants and rot at bay. 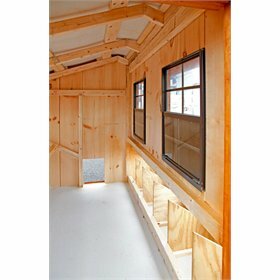 All half-inch hardware cloth wire over the windows and air vents is coated in black vinyl. Two double-hung, slide-up windows with standard screens come with your purchase, for ventilation and to add plenty of light! The windows are 18” wide and 23” high. For extra predator protection, we have added heavy-duty, half-inch vinyl coated black hardware cloth wire over the screened windows. 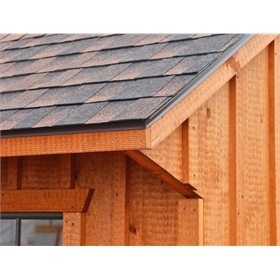 Two gable vents also come standard, for extra ventilation. 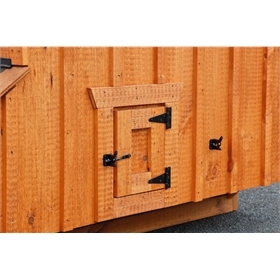 One prop-open ventilation slot comes standard with your purchase. 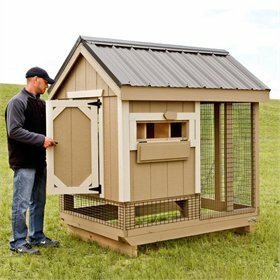 The ventilation slot is covered on the inside with sturdy half-inch vinyl coated black hardware cloth wire, to keep out predators, rodents and wild birds. 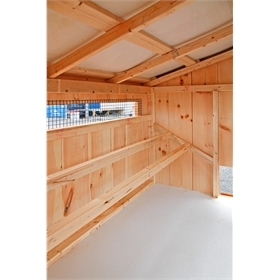 The ventilation slot is located on the back of the coop, and runs nearly the whole length of it. 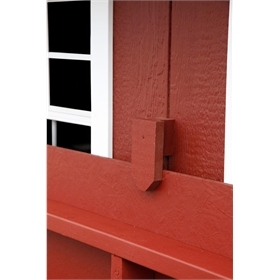 This long vent, in combination with the windows and gable vents, provides plenty of ventilation, which is essential to avian health. 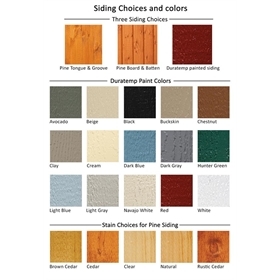 Five-eighths inch, ACQ pressure treated plywood flooring comes standard with your purchase, or you can upgrade to an Epoxy floor for ease of cleaning--a durable, easy to clean surface that is 100% moisture resistant. You may select also select the optional electrical package with heated roost! Talk about luxury. 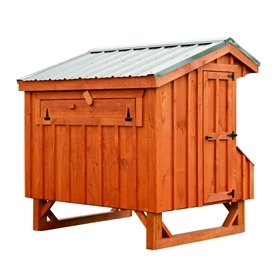 The heated roost is plugged into the receptacle provided by the electrical package, and it’s heated from within by a heated rope, which is completely sealed for safety. 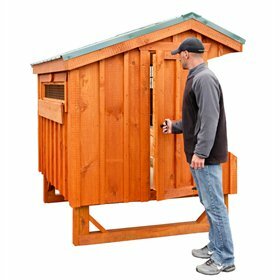 If you think you’ll want to move your chicken coop around the yard, you may opt to add four wheels with a handle/steering handle. Wheels will allow you to move your coop around and provide a fresh grazing area for your chickens, not to mention help you "spread the love" (poop) around. 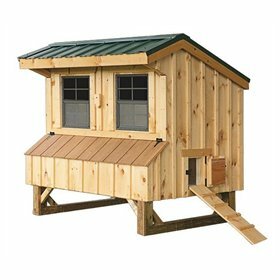 If you’re a stickler about your coop being clean, you can purchase the optional "clean out lid" and/or the epoxy floor upgrade. 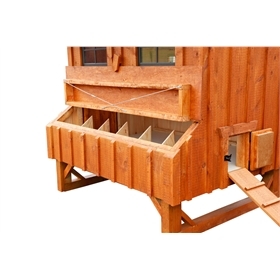 The clean out lid runs almost the entire length of the coop on the back, and it will allow you to access the coop floor for ease of cleaning. 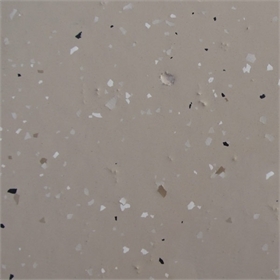 The epoxy floor will allow you to remove the waste and clean the floor easily. Epoxy flooring is a durable and easy to clean surface, that is 100% moisture resistant. 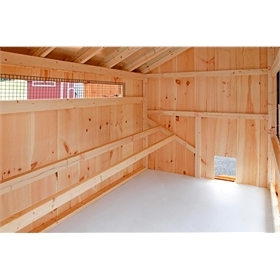 Another option is to order the epoxy flooring and use the large door to rake or sweep the waste out of the coop.